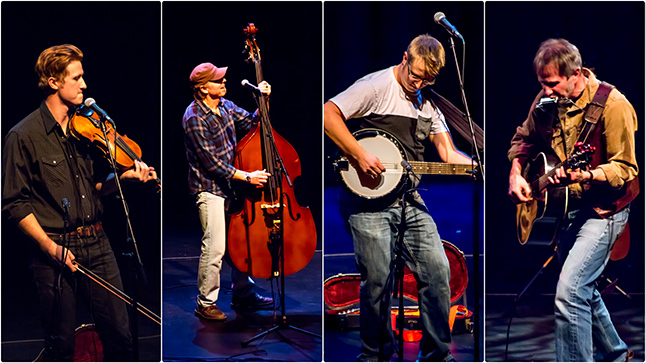 Johnny P Johnny ‘ranch-rocked’ The Arts Centre! 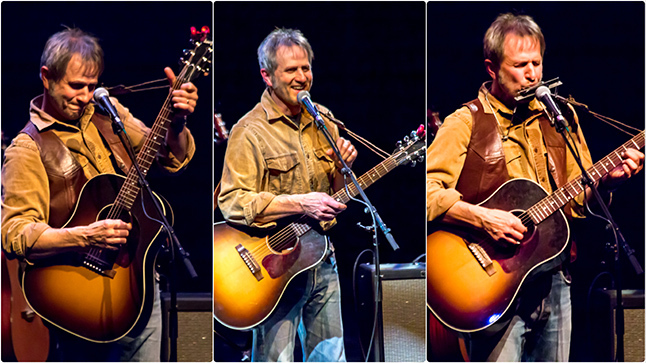 Johnny P Johnson and his compadres brought their energetic brand of ‘Ranch Rock’, Folk, and Country music to the Performing Arts Centre this past Saturday, on a Kootenay tour that began in Kaslo. On his soft high notes, Johnny’s voice is downright soulful, and when he lowers it, registering his deep thick tenor, it warms the auditorium from the floor up through to the ceiling. He has the ability in his voice and his song writing skills to make you hang on every word one moment, like following an unfolding story, to being blown away by a powerful note that reverberates through you the next. His musical influences came through in subtle hints throughout the night, from the way Neil Young’s voice can seem almost ethereal, to the twangy rock of Blue Rodeo, to the ‘every-man’ lyrics of Woody Guthrie and Gordon Lightfoot. On stage, filling out Johnny’s new foray back onto the stage after a 10-yr hiatus to raise his children as a stay-at-home-dad, were a notable group of musicians: Hal Rezansoff, a man who kept the whole skeleton together with the backbeat of his stand-up bass and his never-ending smile; Johnny’s teenage son, Javan Johnson, a very skilled violinist, especially on the haunting Seize the Day, with solid backup vocals; and, guitarist Jason Thomas, who has a tremendous talent for riffing off guitar runs and making his axe cry and sing. Being a fellow Saskatchewan-born boy myself, also transplanted to the Kootenays, JPJ’s songs and stories struck a nice, if melancholic at times, chord with me, making me reminisce about things I hadn’t thought about for a long time. Like the time the grain elevators were taken down and became extinct from the prairie landscape, buildings that stood tall in the flatlands, representing the towns and villages that built them, blood lines for the farmers and their produce. Gone, seemingly overnight. And the landscape has never quite seemed the same or ‘right’ since. JPJ’s stories were often as engaging as his songs. Even as Johnny stepped away from the stage 10 years ago, he mused over how he never stepped far from the music or from writing, once turning a drive down the highway into a song, asking his young son to write on a paper bag the lyrics that popped into his mind as a truck barrelled by. Laughing about his young son asking and getting Canadian Country Music Hall-of-Famer Ian Tyson to sign Johnny’s guitar. The gist of most of his songs are about not taking anything for granted, living for the now, and not being too obsessed with making money if it means sacrificing your dreams. Well, Johnny, I’d say you’ve run all three of those bases after hitting a home run. More photos can be seen at the Facebook page Revelstoke Life & Times.